The Best Of Friends includes, for the first time in official publication, 12 scenarios from the Swedish Friendly Fire ASL Tournament. 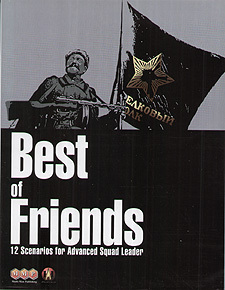 Revised to use official layout and terminology, and in some cases updated for balance, this collection presents a selection of scenarios from the first four "Friendly Fire Packs" designed by Mattias Ronnblom, Martin Svard, and the rest of the Friendly Fire team. These scenarios cover a variety of actions from 1937 to 1945 and feature American, Canadian, Chinese, French, German, Italian, Japanese, Polish and Russian forces in some of the best tournament-sized offerings available in ASL.